The Department of Biology in Camden is housed in both the Science and the new Business and Science buildings which provide graduate students with ample space for instruction, research, and study. Teaching and research laboratories are equipped with a variety of research-quality instrumentation that allows for basic and advanced procedures in cytological, physiological, molecular, ecological and environmental analyses. Laboratory equipment includes electrophoretic and DNA sequencing equipment, liquid chromatographic and TLC apparatuses, a gas chromatograph, phase-contrast and fluorescence microscopes, a scintillation counter, an ultracentrifuge and rotors, a transmission electron microscope, a Storm phosphorimager, ESA CoulArray HPLC and a LECO elemental analyzer. 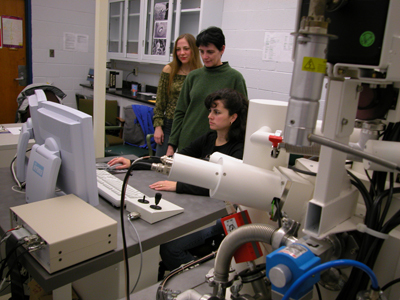 Recently the department acquired a scanning electron microscope equipped with energy dispersive X-ray for elemental analysis. The selected instrument operates under low vacuum, which permits samples to be examined without traditional time-consuming and costly preparative methodologies. Molecular, cellular and physiological research projects at Rutgers-Camden are supported by funds from federal, state and private sources. Field equipment includes vehicles, boats, and a variety of sampling instruments. Ecological research, with support from the New Jersey Department of Environmental Protection, NSF and private foundations, emphasizes the distinctive ecosystems of the South Jersey area, e.g., the Pinelands National Reserve (which is also an international Biosphere Reserve) for studies of pine barrens ecology. The Pinelands Field Station at New Lisbon, NJ in Lebanon State Forest of the Pinelands National Reserve provides dormitory facilities, laboratory and other space for conducting field research in the area. Page last updated by Department of Biology at 10:00 am December 16, 2016 . This page was printed from http://biology.camden.rutgers.edu/research/ at 7:02 AM Sunday, April 21, 2019.